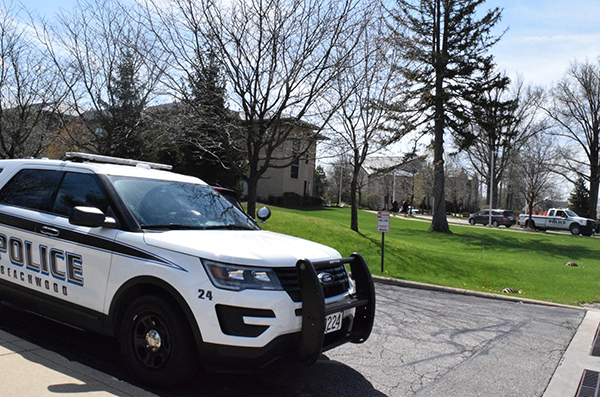 When congregants of Green Road Synagogue in Beachwood gathered for services a week after the mass shooting at Tree of Life Congregation in Pittsburgh’s Squirrel Hill neighborhood, they might have noticed an increase of security with an armed guard at the shul. The synagogue has always had an off-duty law enforcement officer in the vicinity which it shared one with the neighboring synagogues, Rabbi Binyamin Blau said. However, this was the first time Green Road Synagogue hired its own armed guard. Blau did not disclose if an armed guard will be present at future services. In an email sent by the synagogue regarding security and safety, a member of the synagogue’s safety and security committee will continue to carry walkie-talkies and/or cell phones to stay connected to Jewish Federation of Cleveland security personnel, which has been in practice at the synagogue. The decision to have a guard strictly for Green Road Synagogue came after the Federation held an unscheduled security meeting Oct. 31 to review security procedures, training options and share information learned from the Pittsburgh attack. Jim Hartnett, director of community wide security at the Federation and a former FBI agent, led the meeting where local police chiefs, synagogue representatives and other security personal were present. More than 30 representatives attended. Hartnett said the meeting was assembled quickly because it was important to meet with the synagogues to go over information that he’s learned from his FBI contacts in Cleveland, local police chiefs and the director of security at the Jewish Federation of Greater Pittsburgh. He said he wanted to stress one of the reasons why some of the survivors were able to get out of Tree of Life was in part a result of recent active shooter training they received. He also added that everything he’s heard from his contacts indicated the shooting was an isolated incident. “This individual acted alone and at (the time of the meeting) there was no connection that any investigators have seen at that point to our Cleveland community,” he said. Additional investigations are happening as to who the shooter was contacting and what he researched to “try and get a picture of this shooter’s world and, potentially, if there was anyone else connected on a larger scale which at this point there isn’t,” Hartnett said. The day of the shooting, Hartnett said Federation security went to all local synagogues to let congregants know what happened and that they needed to be on high alert until the Federation knew what it was dealing with. The same day local police were asked to provide high visibility in the community and movable cameras were placed throughout the communities to monitor activity. An emergency alert notification also was sent to leaders in the community through text, voice mails and emails. During the security meeting, Hartnett said topics discussed were target hardening, restricting access to buildings, monitoring buildings and a review of security training the Federation can help provide like ALICE active shooter training. Stuart Deicher, executive director of Park Synagogue in Cleveland Heights and Pepepr Pike, said Park always has taken security very seriously. He added the synagogue has always had armed guards at the building and in light of the Pittsburgh shooting, more guards have been added. “The big takeaway is that while Federation is there to help, we also have to get our membership involved and the ‘see something, say something’ is more important than ever,” he said. After the meeting, Muriel Weber, who chairs the security committee at Oheb Zedek-Cedar Sinai Synagogue in Lyndhurst, said there’s more enhancements to be made internally at her synagogue. The synagogue has security options in place, but Weber said it’s a continuous process and they’re looking at what can be added in terms of safety.